Following the disappearance of Washington Post journalist Jamal Khashoggi, seemingly abducted and murdered by order of Saudi Arabian leadership, the world is suddenly refocusing its attention on the Middle Eastern nation. Though Saudi Arabia’s reckoning with the international community has been a long time coming, it seems Khashoggi’s death could finally represent a crucial tipping point. Sadly, such heinous crimes are not entirely unusual when it comes to the Saudi government. Here’s an extremely brief overview of some of the worst atrocities committed by the Middle Eastern kingdom, much of which can be tied to Crown Prince Mohammed Bin Salman’s rise to power. Roughly three months ago, prominent female humans rights activists Samar Badawi and Nassima al-Sada were placed under arrest. Both women have experienced a continuous campaign of harassment, including travel bans and prior arrests. Badawi’s sister, Raif Badawi, was sentenced to 10 years in prison — in addition to 1,000 lashes. Badawi and al-Sada are simply the latest Saudi activists with an international profile to face direct punishment for their work. But Amnesty International claims that such repression has been “unprecedented“ under Crown Prince Mohammed Bin Salman. Prosecutors are currently seeking the death penalty for several of these women. At the beginning of 2016, Saudi Arabia carried out its biggest mass execution since 1980, applying the death penalty to 47 individuals in various prisons across the country on the same day. Saudi authorities maintain that those killed had links to terrorist groups, but international human rights groups have expressed doubt over their convictions. Several of those executed were minors when they committed their alleged crimes; under Saudi law, this should have made them ineligible for the death penalty. Much could be said about Saudi Arabia’s heavy-handed military intervention in Yemen’s now four-year civil war. The Saudi-led coalition in Yemen has earned a reputation for its grave disregard for civilian lives, with airstrikes and other operations often leaving scores of noncombatants dead. From an attack on a wedding that killed 130 and the seemingly deliberate targeting of civilian doctor missions, to the use of internationally outlawed cluster bombs and the bombing buses full of school children, the civilian death toll can be largely laid at the feet of the Saudi coalition. 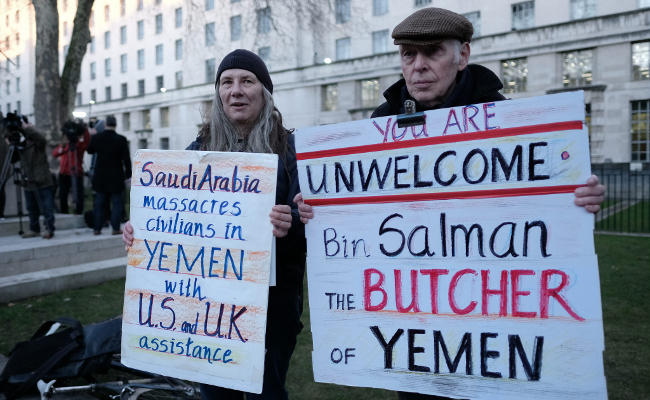 It’s worth pointing out that though these nations aren’t directly involved in the conflict, France, the UK and the United States have all been backing Saudi Arabia’s operations in Yemen — be it financially or through logistics and material support. As horrific as Jamal Khashoggi’s death is – precipitated because he bravely held the Saudi royal family’s feet to the fire over their gross human rights abuses — perhaps one man’s demise will finally wake up the international community to its role in enabling these actions. No human rights in Saudi I'm afraid.